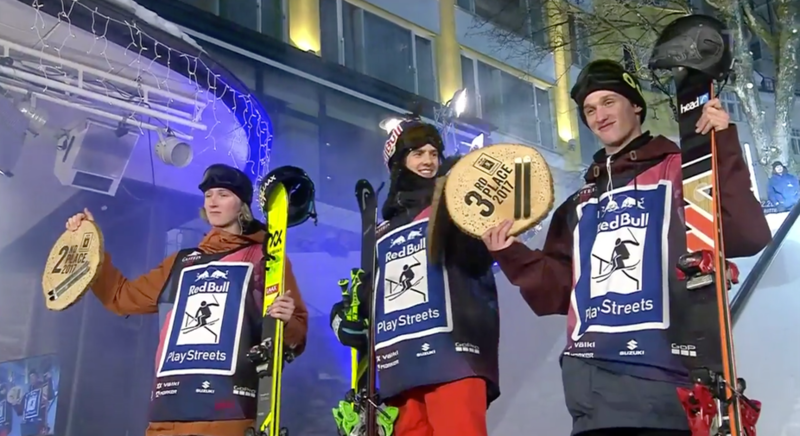 It's been a two seasons since the last Red Bull Playstreets, there was a Bad Gastein shaped hole in the contest circuit last year. Playstreets has always been one of, if not the, best contests of the year and this year was memorable as ever. With even crazier rail features dotting the insane scaffolding course it seemed bound to get crazy, and once again it didn't disappoint. The head to head format is a good spectacle for the crowd and easy to understand, but it does mean the second run is often a safety which can spoil the show a little. I've seen better judging too but I guess that's just like, my opinion man. We were treated to an instant lesson in how tight this course is from Victor Moosman, who landed backseat on the second hip and almost died trying to get up on to following rail in time. Andri Ragettli breezed through with a safety run as a result. BMile also went down as the first rider in his head to head gifting his heat to Dennis Ranalter. Jeremy Pancras killed it in heat 3 with a whole new approach to the course, using every feature differently. Dope lines from him and a relatively clear win. It was crazy to see Fabio Studer, more usually a Freeride World Tour guy, return to Playstreets and throwing down on a street course. He would have taken the win against a lot of guys but Laurent DeMartin, who was starting things off with an insane flat 810 to switch 450 on the first two features, was just too strong. Gutted to see Dan Hanka go down on what was shaping up to be a great run but again, it was a refreshing style to see in a contest. His opponent Lukas Mullauer didn't hold back though, and really set a benchmark score for the event with a 242. Slayer. Cody LePlante took the closest win of the round, edging out Johan Rohrmoser with a jibby run. Tom Ritsch went for the consistency option with a clean run, including a silky blind surface swap in the middle. He faced Russ Henshaw, who went consistent too with some 270/450s on the hips and a kfed down at the bottom. Turned out he took it too easy and fell just short of Tom's score. In the final heat, Jesper faced a crash score and breezed through. Dennis Ranalter crashed on hit one to give Andri Ragettli a second pass. He still took the opportunity to hint at what his real run would be and the front swap pretz 2 to switch 2 disaster combo was the best we'd seen on those rail features to this point. Jeremy Pancras stomped his creative line again, including a journey round the back of the third hip to handrag 3 on the knuckle. He was met by Laurent DeMartin with his enormous flat 810 and nuts style. The judges took some time but it had to be Laurent, hyped for my boy! Lukas Mullauer has his run on lock and fairly easily dispatched Cody LaPlante who had a couple of bobbles. Tom Ritsch had some mistakes on the way down too and Jesper took no chances chucking the dub flat on the first hip and going enormous to seal his place in the semi final. Laurent opened things and went massive on hit one but went too deep and scrubbed out. He styled out the rest but it opened the door for Andri who actually had his own mistakes. Somehow the judges still scored him super high despite 2 big errors. For sure he won but what an odd decision, the first of several. Lukas Mullauer threw down a decent run to put Jesper under pressure, but there were couple of missed grabs. Jesper chucked the dub again up top and was definitely more technical overall, but his last rail was definitely off early. `Yet Jesper took the win. Definitely questionable, redefining calling it loose. In the third place playoff, Laurent went down again on that flat 8 gifting third to Lukas Mullauer who was the most consistent skier of the night. I'd say it was the trick of the night when stomped though. Lukas also had some pretty questionable makes in the run but it was enough for third. In the main event, Jesper put down the dub up top, and a clean run all the way down (dub flat, front 4, back 4, AO 3 mute) to the final feature but at the bottom he buttchecked on the 450 disaster. Andri Ragettli however couldn't put it down clean in his first real run under pressure. Missed a couple of grabs and got caught up on the front swap pretzel 2. Jesper with the win and on this one i'd agree, but it was somewhat controversial he even made the final. He also won the Best Trick for his dub, which also reflects on the judging somewhat. Nonetheless it was a dope event, see you again in two years Austria.